New Jersey Gov. 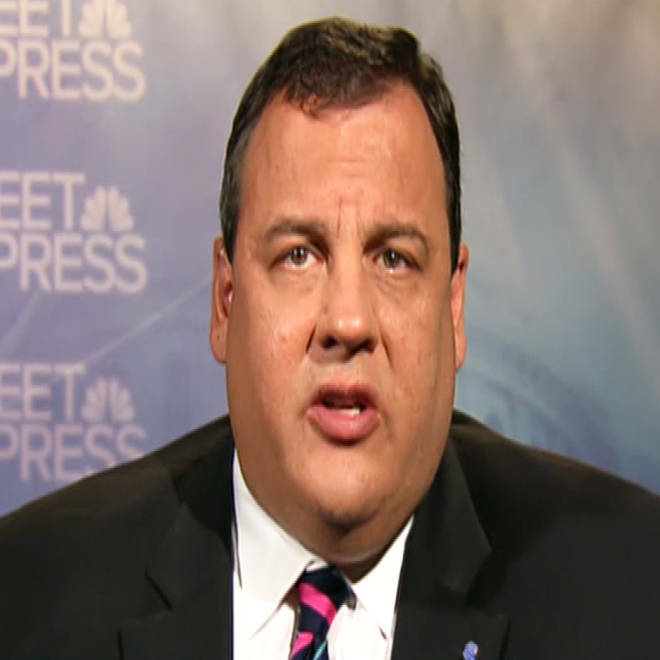 Chris Christie predicted on NBC’s Meet the Press that Republican nominee Mitt Romney will change the dynamic of the presidential race in Wednesday’s debate with President Barack Obama. New Jersey Gov. Chris Christie and White House adviser David Plouffe visit Meet the Press to evaluate the current state of the 2012 race and make their candidates' cases. “On Wednesday night Mitt Romney is going to be standing on the same stage as the president of the United States. And I am telling you David, come Thursday morning the entire narrative of this race is going to change," Christie told NBC’s David Gregory. Asked whether it was too late for Romney to reverse polling numbers which show him behind Obama in battleground states such as New Hampshire, Nevada and Ohio, Christie contended that “the general public that I speak to in New Jersey and elsewhere are just beginning to really tune in to this race." “Wednesday night is the restart of this campaign,” Christie argued. “I think you’re going to see those (polling) numbers move right back in the other direction” as a result of the debate. Christie criticized Obama for “just trying to run out the clock, he desperately wants to run out the clock with platitudes" as the days dwindle down to Election Day, Nov. 6. On the campaign trail, Obama enjoys a percentage point bump and practice with debate partner John Kerry. Meanwhile, Ann Romney worries about her husband's "mental wellbeing" if he is elected. NBC's Kristen Welker reports. “The president’s happy talk for the next 36 days is not going to anesthetize the American people,” the New Jersey Republican said. Christie, whom some Republicans wanted to run for the presidential nomination, gave the keynote address at the Republican convention and may be a leading contender for the 2016 nomination if Romney loses on Nov. 6. Romney is increasingly behind in the national public polls, which means the Republican GOP candidate must focus on succeeding at the first presidential debate in order to rally his troops. NBC's Chuck Todd provides analysis. Following Christie, Obama adviser David Plouffe said Romney and his aides “expect to come out of this (debate) with the race fundamentally changed. What does that mean? If it’s going to fundamentally change, that means seven or 10 days from now, you’ll see states like Ohio tied, states like Iowa tied, because that’s what really matters here, so they set the bar quite high” for Romney’s performance on Wednesday night in his confrontation with Obama. The Obama adviser addressed the administration’s handling of the aftermath of the Sept. 11 attack on the American consulate in Benghazi, Libya, which resulted in the killing of U.S. ambassador Chris Stevens and other American diplomatic personnel. Plouffe said it was “preposterous” for Romney to charge that Obama had failed to be candid with the American people about what happened in Libya and about the continuing danger of al Qaida attacks. On Sept. 16 on Meet the Press, U.S. envoy to the United Nations Susan Rice called the attack “initially a spontaneous reaction” to an attack on the American embassy in Cairo and to a video which mocked Islam and its prophet Muhammad. But the Obama administration has changed its tune, with spokesmen saying in recent days that the attack was an attack of terrorism. “The important thing that the American people want to understand is: are we taking the right steps to secure our personnel, our ambassadors?” – and that issue is what the Obama administration is focused on, Plouffe said.